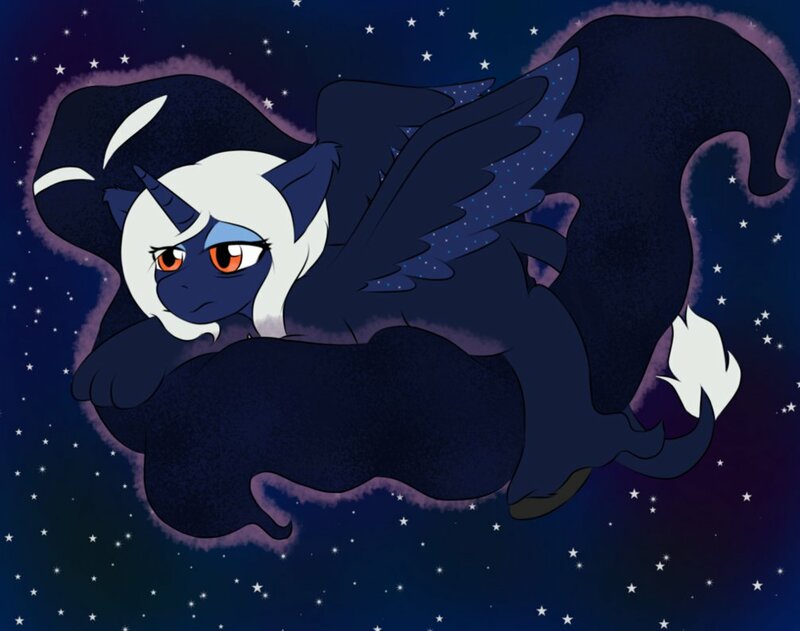 Desert Moon has awoken to find herself floating through the sky... She is only slightly miffed. Ever since she was young, Desert has had an 'imaginary' friend named Tanti. Tanti would keep her company on the long nights where she'd usually be struggling to stay awake. It told her stories about her mom, listened to her whines about missing out on dessert because she fell asleep and being a constant companion. It was only when she got older that she realized that Tanti was a lot more than just a figment of her imagination. Tanti was real and spoke to her about the Dreamscape. While Desert can't travel into dreams like her mother, Tanti can and lets her ride on it into the Dreamscape. She can't interact with anyone the dreams (She is like a earth pony with clouds) and needs Tanti to keep from falling into the void but enjoys the trip. Tanti mostly just goes there to consume Nightmares and Desert just likes the feel of the Dreamscape. Note: Desert met Skyla through her nightmares. Apparently, Tanti loves the taste of her nightmares the most and always visited her. Desert eventually decided to introduce herself to the mare since she felt it was rude to have her friend feast on ones dream before even introducing ones self. The only ones Desert has told about Tanti is Skyla and North, though Tanti doesn't like North. Apparently, his dreams are 'empty and tasteless'.